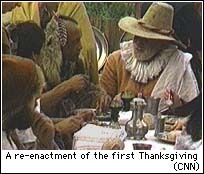 ANN ARBOR, Michigan (CNN) -- The first Thanksgiving may have been the most important pot-luck dinner in history. The pilgrims and Native Americans each contributed the foods they knew and grew, and in 375 years, the basic menu hasn't changed all that much. "We think turkey was part of it, but we're not certain," said food historian Jan Longone. "We know that wild ducks were, we think lobster was because it was so ubiquitous at that time. Assuredly corn, and squash and beans." While the menu may not have changed much, some of the basics, like corn, sure have. According to the University of Michigan's Dr. Richardx Ford, a type of maize called Northern Flint maize would be similar to the corn the first Thanksgiving participants had. They probably didn't eat it on the cob with butter or salt, though. "Most likely they removed the kernels, ground them up and prepared them as a form of soup or put it with wood ash and made a kind of a hominy," Ford said. Pumpkins have changed too -- they weren't always bright, orange and plump. "The first pumpkins we had were very small, gourd-type things," Ford said. And you might not recognize the recipes the pilgrims used as anything you'd prepare today. However, there are a few that are similar. 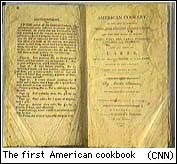 This Thanksgiving marks the 200th anniversary of the first American cookbook, called "American Cookery." According to Longone, it contains at least a few Thanksgiving recipes still used today. "The one I think is best is one they call Pompkin Pudding, but really it's pumpkin pie. You start with one quart of stewed and strained pumpkin, three pints cream, nine beaten eggs, sugar, mace, nutmeg and ginger." There are only six remaining original copies of the book, of which the University of Michigan has one. It was written by an orphan named Amelia Simmons. Although we have more leisure time today than the pilgrims did in the 17th century, big meals that take a long time to prepare may be less often seen than they once were. Today's trend-watchers say many families are sparing the bird and opting for vegetarian meals. But those who do choose the traditional turkey are not only stuffing them with dressing, but dressing them up to look their best.